Teatime, the Reykjavik-based mobile gaming company backed by Index Ventures and Atomico, launched Teatime Live, the world’s first ever face-to-face mobile gaming platform that lets users communicate with fellow players with real time video chat while playing. 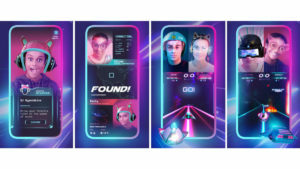 The launch is part of the company’s efforts to make mobile gameplay a truly social experience and will allow other games studios to build new games on the platform, ushering in a new era of human interaction in gaming. 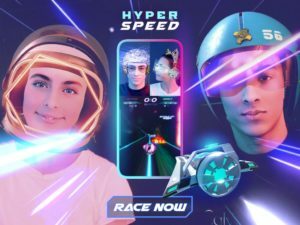 The first game launching on the platform is Hyperspeed, a fast and furious space racer where players race against their friends while being able to see each other’s reactions in real time. Over the last decade, the number of mobile gamers has exploded, but even as this number increases, the social elements of mobile gaming have not caught up. As the popularity of apps such as Snapchat and Instagram illustrate, image and video are a core part of how people want to interact with their friends on mobile. By combining live video, AR technology and mobile gaming, Teatime’s mission is to bring socialising back to the gaming industry by breaking down the barriers of the screen. Teatime’s new platform will put the social back in mobile gaming and offers a face-to-face connection with opponents. Every Teatime game begins by prompting new users to select a “Gameface”—an AR filter that is used during two-way live video as you play. The first game on the platform is Hyperspeed, a game in which players race their friends in outer space. After choosing a Gameface and starship, the game begins with two-way live video showing both players racing against each other. Reactions to sharp turns, obstacles and lead changes are all captured in real-time, giving players what other mobile games lack: the fun of communicating and seeing opponents’ reactions. “Everyone at Teatime is incredibly excited to launch a new way to play mobile games, and we hope to see other games studios building interactive experiences on the platform. Hyperspeed is one example of a game using Teatime Live that we’ve created, but we expect to work with other game studios on many different genres” says Thor Fridriksson, co-founder and CEO of Teatime Games. Following a recent $9 million Series A, Teatime plans to launch several other social mobile games on the Teatime platform within the next year following launch. Teatime’s founders are Thor Fridriksson, CEO, Gunnar Holmsteinn, COO, Johann Thorvaldur Bergthorsson, CTO and Ymir Finnbogason, CFO. Teatime’s experienced group of founders are all former executives of QuizUp, the fastest growing mobile game in 2013 that turned into a worldwide phenomenon with over 100 million players. QuizUp revolutionised the world of mobile trivia games, and Teatime strives to do the same by making its latest games competitive, fun and most importantly: social.